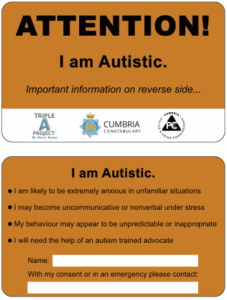 The Triple A Project is proud to be able to offer, in partnership with Cumbria Police, an Autism Alert Card for individuals on the autism spectrum within Cumbria. The alert card enables those that carry it to identify themselves to workers in emergency services as being on the Autism Spectrum. 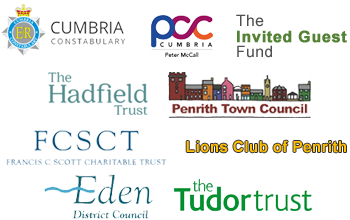 It has been designed by Triple A Project with Cumbria Police to be recognised by their officers but can be used to show personnel from other emergency services such as fire officers and ambulance staff. If you would like to find out more information about the Autism Alert Card you can email alertcard@tripleaproject.org.uk or contact Helen Storey at Triple A Project on 07818 410421. © Copyright 2018, Triple A Project. All rights reserved. Triple A is a registered charity no. 1177317.